MATE is a GNOME 2 (which is now unmaintained) fork that lets you use the old GNOME 2 interface. It uses renamed packages and applications so it doesn't conflict with GNOME 3 and you can have both MATE and GNOME3 installed in the same time, something which isn't possible with the vanilla GNOME 2. MATE 1.2 has been released recently, and its developers say this is a huge step forward and the latest version is more stable than ever. Before installing MATE in Ubuntu, please note that MATE is a pure GNOME 2 fork, so it doesn't support Ubuntu appindicators, there's no Ubuntu Sound or Messaging menu, etc. 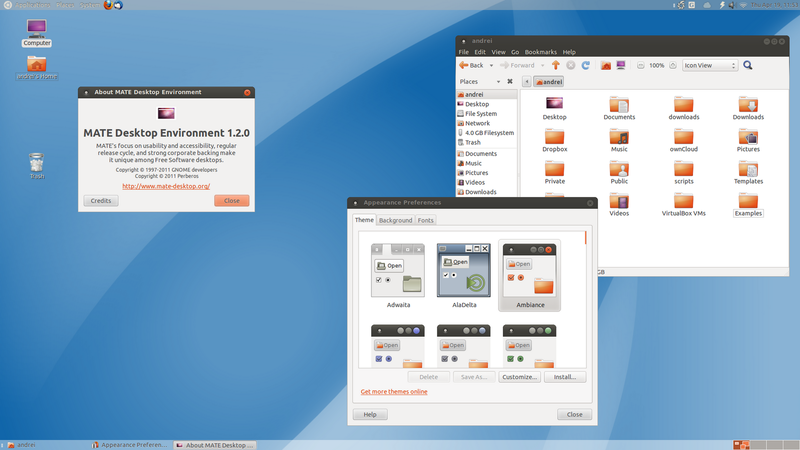 In my test, MATE Desktop worked ok under Ubuntu 11.10, but there were some issues with MATE Settings Daemon in Ubuntu 12.04: the GTK theme wasn't applied correctly. I was able to fix this by adding "MATE" to "OnlyShowIn" for the /etc/xdg/autostart/gnome-settings-daemon.desktop file. For more information about MATE, installation instructions for other Linux distributions, etc., visit the official MATE website.